Provide wrens, chickadees, and other small songbirds in your yard a secluded nesting place in the Heartwood Wren in the Wind Hanging Bird House. 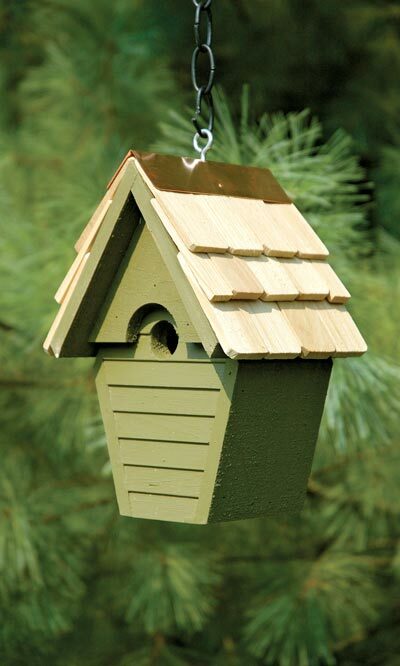 This artfully designed, olive green painted bird house is made from solid cypress and features a 1.5" wide copper trim on either side of the peak to provide a stylish appearance. An eyelet screw is fastened in the center of the roof for quick and easy hanging. Grooves on the front of the bird house allow adult wren easier access to the bird house and the 1" opening prevents larger birds and predators from entering. Secured over the entrance hole is a 0.5" thick piece of cypress which also helps to discourage sparrows, starlings, and cats. The floor features a drainage slot to help keep the nesting cavity clean and dry. The convenient copper cleanout panel on the back of the bird house can be easily removed for seasonal cleaning. This handmade birdhouse comes fully assembled and may be post mounted. Provide your feathered friends with a cozy nesting spot with the Wren in the Wind Hanging Bird House. Handcrafted in the USA. Droll Yankees Squirrel Guard, Green, 15" dia.